This years annual summer camp was held at RAF Shawbury. During the camp we did a range of amazing activities including shooting, flying the Grob Tutor, having a ride in a Squirrel helicopter and visits to various places around the camp. Everyone really enjoyed it and it was a fantastic opportunity to visit a working RAF station. More photos are available on our Facebook page. Orwell Walk 2010, a great success! Well done to everyone! It was one of the hottest days of the year so far, very challenging but worth all of the effort. Thirteen cadets and staff walked the mixture of 12, 18 and 25 mile courses, beginning at 8:30 am, with the last team coming in at 2.30pm. We all enjoyed varied conditions, from dry, hard earth to boggy, slippery shoreline along the River Orwell. The first in over the line was our Chairman; Mr Dave Brown, show how its done sir! We also had a member of staff who completed the 25 mile course in record time by ‘running‘ seven miles of it…no names mentioned…Mr Cornish sir! Well done all, we will add up the sponsorship raised and publish the grand total very soon. Categories: Manningtree Air Cadets, Social Events, Sports | Permalink. Another sporting achievement for 1334 Manningtree Air Cadets… 3rd place in the Norfolk and Suffolk Wing 6-a-side Football. To our 8 team members who took part last Sunday – Well done, the tactics worked! Categories: Manningtree Air Cadets, Sports | Permalink. Well done to our team in 2010! Now that the light evenings have arrived Cadets can enjoy plenty of outside activities on our weekly meeting nights. Activities range from general sports and exercise to competitive tasks and fitness tests. Cadets can participate in many events at regional and national level too such as Wing Athletics on the 9th May. If you are interested in sport come and visit us, there are plenty of opportunities open to you. Our wing ‘Norfolk and Suffolk’ took part in the Inter-region Rugby Tournament on Sunday and came first after battling with ATC Wings from all over the UK. Our very own Cdt Richard Taylor Fern (back row, second from right) was a member of the winning team, playing number 5 – second row prop and coaching was provided by 1334 Squadron’s C.I. Wright (back row, middle). The competition took place at RAF Brampton on Sunday 28th February and was the first time the Norfolk and Suffolk Wing has won the tournament in 25 years! Well done to the team and our man Richard Taylor-Fern. Thanks to C.I. Michelle Angland for the photo. Well done to Cadet Oliver Lockwood who was presented with the ‘Wing Blue’ on Monday for his athletic achievements while representing his wing at the high jump, coming 4th overall in the Norfolk and Suffolk wing. 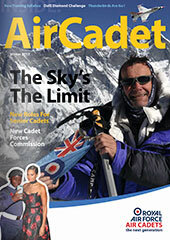 Categories: Manningtree Air Cadets, News, Sports | Tags: 1334, Air Cadets, Manningtree, Wing Athletics | Permalink. It was a bright warm day as the 28 Air Training Corps Squadrons from across Norfolk and Suffolk Wing assembled at Lynn Sports Centre, Kings Lynn for a full day of Athletics competition. As ever the rivalry and sense of competition was electric around the stadium as the 400 competitors battled it out across the full range of track and field events in front of a large crowd of spectators. As ever it was another excellent day for the air cadets of 1334 (Manningtree) Squadron. Flt Lt Janet Brown the Squadron Commanding Officer said “An excellent turn out by our Squadron, well done to all the cadets, we did much better at the field events this year, it was a fantastic team effort by everyone. Cadet Oliver Lockwood (14) had a fantastic sporting day representing the Squadron for the first time. As well as winning a Gold medal for the Long Jump, he then went on to win a Bronze medal in the 400mtrs. Oliver said “it was a great personal achievement for me to represent the Squadron and to win a Gold and Bronze medal”. The cadets from Manningtree competed all day with good results, with Cadet Oliver Lockwood being selected to represent the Wing in the inter Wing athletics championships in Leicester, for his selection Oliver will gain his Wing Blue. Categories: Manningtree Air Cadets, Sports | Tags: 1334, Air Cadets, Manningtree, Wing Athletics | Permalink. This years Athletics was good fun. We returned home with one gold and one bronze thanks to Oli! Oliver has been picked to represent Norfolk & Suffolk Wing for the high jump. We wish him good luck and hope he does well. Thank you also to Flt L Brown for taking us.